You are what you eat. We’ve all heard this adage for as long as we can remember, but just because it’s an adage doesn’t mean it’s not true. Foods have a powerful effect on our bodies – not just as fuel, but as a means to good (or bad) health. America is in the throes of an obesity epidemic, as well as a diabetes epidemic. This is mainly due to our diets, and the conflicting forces controlling what eat as a nation. Economics demands both parents in a household work outside the home, leaving little time for the cook in the house to make fresh food, and introducing a reliance on processed foods. Processed foods are high in sodium, used as a preservative, and nutrients are cooked out during the canning. Frozen foods have higher nutrient levels, but are still not as good for you as fresh. Some advocate no processed foods at all – canned or frozen, and no processed baked goods. Our diets also contribute to high levels of inflammation, and this is a problem if a person has arthritis – specifically, rheumatoid arthritis. Osteoarthritis happens as wear and tear on our joints reduces cartilage and allows an overgrowth of bone. This form of arthritis is not as susceptible to inflammation as rheumatoid arthritis, and doesn’t respond as well to dietary changes; however, other forms of autoimmune disease, such as fibromyalgia, do respond to inflammation levels in the tissues, so dietary considerations apply. There are numerous articles on what types of diets are best, from weight-loss to pain management. However, no diet works for everyone – we are all individuals, responsive to our genetic makeup, and we respond differently to the same stimuli. One diet does not fit all. There is, however, agreement on pain triggers for arthritic conditions, and six main dietary pain triggers are listed below. There is a school of thought believing your diet affects your body’s pH levels. Your body typically is alkaline in nature, and it regulates its pH levels rigorously. The non-alkaline diet is felt to contribute to lowering the body’s pH level, making it acidic. Acidic conditions lead to free radicals, and many forms of disease. However, food’s effect on your body’s pH level is actually minimal. Proponents of the alkaline diet say although the body regulates pH, a highly acidic condition will result in the body becoming more acidic over time, leading to disease. There are two types of foods – acidic/alkaline, and those resulting in an acidic/alkalinic condition when digested. The latter is the more important consideration, as these foods will have more impact on your body’s efforts to regulate its pH levels. The non-alkaline diet may cause arthritis pain, but not because of pH levels; a non-alkaline diet contains many foods known to cause inflammation, and it’s these foods, not the pH levels, causing the problem. An alkaline diet is beneficial, because most of the foods on one are good for you anyway, not just because of the pH. Everybody says fried foods are not good for you; they make you fat because they are fatty, they cause arteriosclerosis, they raise your cholesterol levels, yada yada yada. In truth, fried foods are not the devil’s spawn. A fried food is not necessarily high-fat – it depends on how it’s fried, and what it’s fried in. The same goes for cholesterol levels and arteriosclerosis. A properly fried food does not absorb large amounts of grease, and if it’s fried in a healthy oil, does not contribute to your cholesterol levels. The trick is, an oil can be used once for frying, and must be discarded after the one use. Heat denatures oil, turning it into not-nice substances. Throwing out oil after one use is not economically feasible for restaurants and fast-food chains, so you’re getting chicken, French fries, fried pies, fried steak, egg rolls, etc., fried in denatured oil. These foods are bad for you, but not because they’re fried – because they’re fried in dangerous oil. 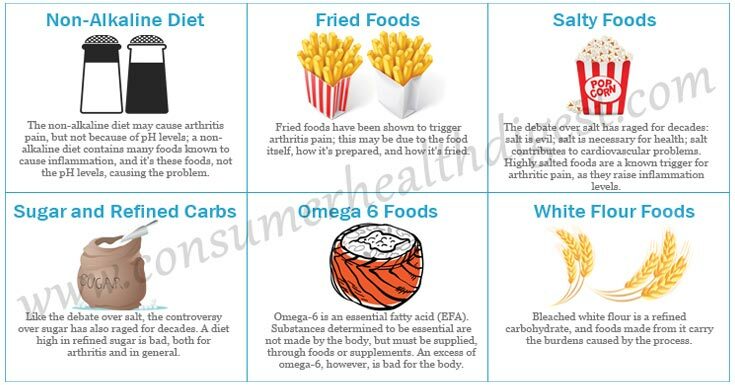 Fried foods have been shown to trigger arthritis pain; this may be due to the food itself, how it’s prepared, and how it’s fried. And fried foods are not a trigger for everyone – you need to experiment and record your responses to the foods in your diet to know if a fried food is a no-no. The debate over salt has raged for decades: salt is evil; salt is necessary for health; salt contributes to cardiovascular problems; salt is necessary for cardiovascular health. And so on. First and foremost, salt is necessary to a healthy body. That being said, salt in proper proportions is necessary. Too much sodium, like too much of anything, is bad for a body. The major problem with sodium is the nature of the American diet – high in processed foods. Salt is used as a preservative, so the sodium content of a serving of a processed food is much higher than the sodium content of a freshly prepared equivalent. This leads to an over-consumption of salt in our diets, and, as Martha would say, this is not a good thing. Highly salted foods are a known trigger for arthritic pain, as they raise inflammation levels. This again is due to the food itself, and how it’s processed. A canned serving of corned beef is much worse than a serving of corned beef from a deli, although neither is particularly good for you if you have arthritis. Like the debate over salt, the controversy over sugar has also raged for decades. The difference is, while salt is necessary, refined sugar is not. A diet high in refined sugar is bad, both for arthritis and in general. Raw, or natural, sugars are not so much a problem, but you won’t find either in a processed food. Refined carbohydrates are also on the bad list, as the refining process removes all the nutrients from the base carbohydrate, and potentially raising its glycemic load. Refined sugars and carbohydrates play havoc with a body’s insulin response, leading to metabolic syndrome and type 2 diabetes. They also contribute to free radicals and inflammation, making them a problem for arthritis sufferers. Omega 6 is an essential fatty acid (EFA). 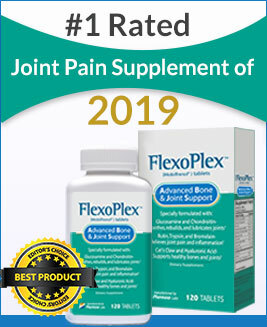 Substances determined to be essential are not made by the body, but must be supplied, through foods or joint pain supplements such as Omega XL. Omega 6 is a necessary substance for health. An excess of omega 6, however, is bad for the body. The ratio of omega 6 to omega 3 EFAs is the key. Low ratios of omega 6 to omega 3 are considered healthy, and help the body repair damaged cells. High ratios of omega 6 to omega 3 have exactly the opposite effect – this leads to the production of inflammatory prostaglandins and causes inflammation in the tissues. High levels of omega-6 are triggers for asthma and arthritis patients. While it is necessary to consume omega-6, the ratio to omega 3 must be maintained. Foods considered to be healthy and containing omega-6 must be consumed in moderation if you have an inflammatory condition, such as asthma or arthritis. Experiment and record your food triggers. Not just the food – it may be the amount of the food, so track that as well. The refining process for flour strips off the bran from the wheat grain before it’s milled. This removes most of the nutrients, and the resulting flour is pretty much neutered. Manufacturers of white flour add back the nutrients they removed, but the process makes bleached white flour problematic. Unbleached flour is better for you; it still has the bran removed, but the bleaching process makes the resulting flour harmful. Bleached white flour is a refined carbohydrate, and foods made from it carry the burdens caused by the process. Flour, specifically wheat flour, is a source of gluten, and refined white flour contains gluten and not much else. Gluten is a protein, and like the casein found in dairy products, can result in inflamed tissues, resulting in pain for people with inflammatory conditions like arthritis. If you suffer from an inflammatory disease, such as arthritis or asthma, management of your diet is an important step to pain-free living. Proper diet can reduce the number of asthmatic episodes, and lower the pain level of those with arthritis. After all, you are what you eat.